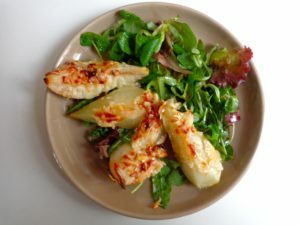 The salty tang of parmesan cuts the sweetness of roasted pears in this unusual salad. The mix of flavors is enhanced by the gentle tartness of tender greens bathed in a garlic-infused vinaigrette. For best results, choose pears of any variety that are ripe but firm. For the tender greens, a combination of arugula, lamb’s lettuce, baby spinach and/or bits of red oak lettuce works well. Preparation takes about 10 minutes, followed by 30 minutes of roasting time. The salad can be served as a light lunch dish, perhaps accompanied by some cured country ham on the side, for example prosciutto. It can also star as the starter of a larger meal. Bring out a bottle of fruity red and pass the crusty bread. The quantities below are for two people, but you may want to double the recipe, as I did, since the pears can be reheated the next day and served as a side dish with roasted meat. Preheat the oven to gasmark 6 (180 C, 350 F). Peel the pears — this is easiest using a vegetable peeler. Cut them in quarters and remove the cores. Using the larger holes of your grater, grate the parmesan. Butter the bottom and sides a baking dish and pile in the pears, curved side down. Cover with the parmesan. Sprinkle with 1/4 tsp. salt. Roast for about 30 minutes, or until the cheese is bubbling and golden brown. While the pears are roasting, prepare the vinaigrette. Spoon the olive oil and balsamic vinegar into the bottom of a salad bowl. Stir well. Add the remaining 1/4 tsp. salt and grind in some black pepper. Peel and halve the garlic, and add. When the pears come out of the oven, allow them to cool for a moment. Remove the garlic halves from the salad bowl, add the tender greens and toss lightly. Place the salad on individual plates, top with the pears and serve. Serves 2. This recipe was inspired by J.-F. Mallet’s wonderful cookbook ‘Simplissime’.